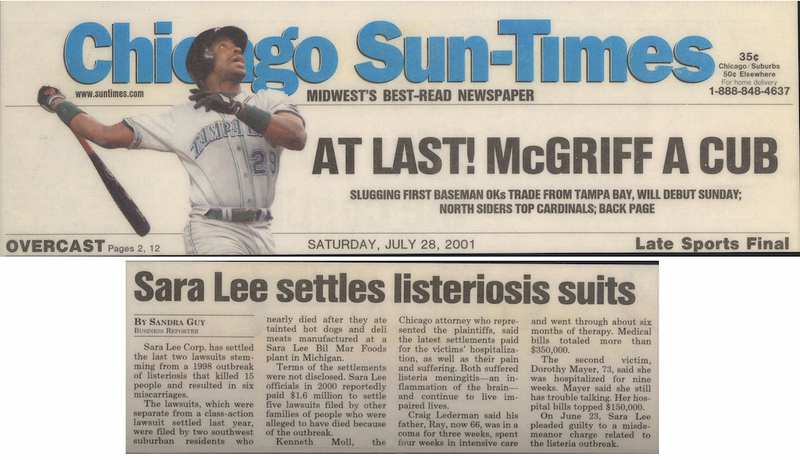 Sara Lee Corp. has settled the last two lawsuits stemming from a 1998 outbreak of listeriosis that killed 15 people and resulted in six miscarriages. The lawsuits, which were separate from a class-action lawsuit settled last year, were filed by two southwest suburban residents who nearly died after they ate tainted hot dogs and deli meats manufactured at a Sara Lee Bil Mar Foods plant in Michigan. Terms of the settlements were not disclosed. Sara Lee officials in 2000 reportedly paid $ 1.6 million to settle five lawsuits filed by other families of people who were alleged to have died because of the outbreak. Kenneth Moll, the Chicago attorney who represented the plaintiffs, said the latest settlements paid for the victims' hospitalization, as well as their pain and suffering. Both suffered listeria meningitis--an inflammation of the brain--and continue to live impaired lives. Craig Lederman said his father, Ray, now 66, was in a coma for three weeks, spent four weeks in intensive care and went through about six months of therapy. Medical bills totaled more than $ 350,000. The second victim, Dorothy Mayer, 73, said she was hospitalized for nine weeks. Mayer said she still has trouble talking. Her hospital bills topped $ 150,000. On June 23, Sara Lee pleaded guilty to a misdemeanor charge related to the listeria outbreak.